Thanksgiving is probably my favorite time of year. As a chef, I have come to love the fall season and all the wonderful flavors that can be produced between sweet and savory. Another reason I love it is because my charity, Harvest From The Heart, is focused on helping those who are less fortunate on Thanksgiving Day. With the help of hundreds of volunteers, food is prepped at my Potrero Hill Restaurant, Market & Rye, and delivered to thousands of people throughout San Francisco. After all of the meals are handed out, it is time to get together with my family and friends and give thanks for what we have every day. The following recipes are based on what I consider the three best parts of Thanksgiving: the main meal, dessert and leftovers. For the main meal, I have developed Smashed Yams infused with Anchor Brekle’s Brown. These sweet, yet savory potatoes can be served along with your turkey and cranberry sauce much to everyone’s enjoyment. And the leftovers can be saved for my leftover dish, Pilgrim’s Pie. A twist on Shepherd’s Pie, Pilgrim’s Pie uses Thanksgiving food that might be leftover from your large family meal. You can also use new ingredients like the ones I have listed, or play with it and make it your own, but make sure to use Anchor Steam Beer. It adds richness and makes for a great reduced sauce. For dessert, I decided to put a spin on my very favorite dessert, Pecan Pie. But this is no ordinary Pecan Pie. 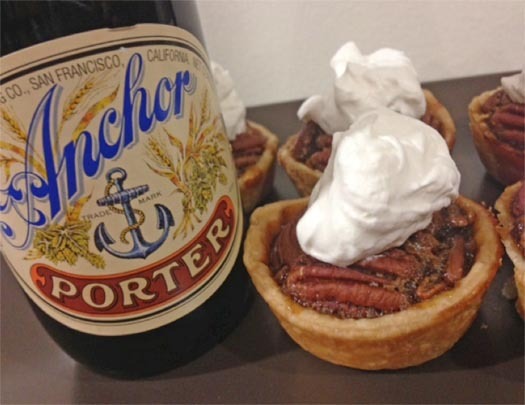 It is an Irish Pecan Pie – baked with Anchor Porter and an Irish Whiskey/Irish Cream Whipped Cream shot on top. This sweet treat is a true holiday indulgence! Happy Holidays to you and yours, and yes, I am thankful for Anchor Beer! Fill a large pot with salted water, bring to a boil and place yams in water. Cook until a fork can be inserted with no pressure needed to go through. Strain yams, reserving some water. In a separate bowl, add yams, Brekle’s Brown, spices and butter. Mix until combined, adding water for desired thickness. Sauté carrots, parsnips and mushroom in the olive oil until starting to get tender. Add in the onions and sauté for a minute or two then add the meat. Add the butter and beans. Add tomato paste, Anchor Steam Beer and Worcestershire sauce. Let this reduce slightly then add the stock. Reduce down until you have a thick, meaty gravy. Season to taste. Remove from heat. Grease a 9×13 casserole dish with butter and add the sauce. Spoon or pipe the smashed yams over top. Brush with beaten egg and sprinkle with Parmesan cheese if desired. Bake for about 20 minutes or until the yams are nice and browned on top. 4 to 6 hours before you are ready to bake, combine the pecans and Anchor Porter in a small container; seal tightly and shake the container occasionally to promote even soaking. Set a strainer over a small bowl to catch the beer; strain the nuts, reserving the 2 ingredients separately. Position an oven rack in the middle of the oven and preheat to 325 degrees. Combine the brown sugar, corn syrup and butter in a medium mixing bowl and whisk until incorporated, stirring constantly, until the brown sugar has melted and the mixture is well combined. Place the pie crust in a 9-inch pie plate, crimp the rim decoratively and place the pie plate on a baking sheet. Place the soaked pecans on the bottom of the crust. Combine the eggs, beer, vanilla extract and salt in a medium mixing bowl and mix well. Gradually add the slightly cooled sugar mixture, stirring to combine thoroughly. Pour the mixture over the pecans in the pie crust. Bake for 50 minutes to 1 hour or until the center of the pie has set. Transfer to a wire rack to cool completely. While pie is baking, combine all ingredients for whipping cream in mixer and whisk until soft peaks form, about 5 minutes. Once pie is cool, cut slices and add a “shot” of whipped cream on top. 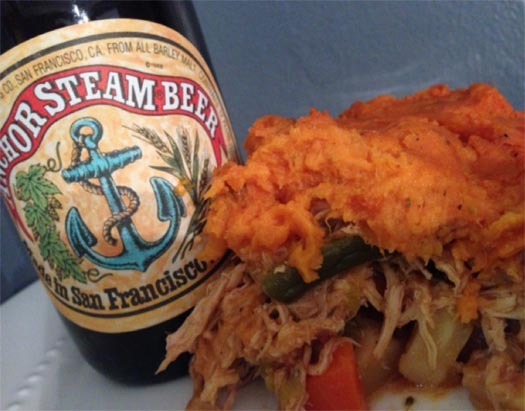 Share your cooking with beer creations with us on social media and tag @AnchorBrewing for a chance to be re-posted! Use our handy Beer Finder to locate a brew near you! Happy Thanksgiving!